In this arid Utah climate, water is a precious resource. With over 20 years of experience, our Draper based company has the experience and knowledge necessary to help you build your dream drought tolerant landscaping. Known as Xeriscaping, drought tolerant landscaping incorporates water efficient sprinkler systems, drip systems, and the use of naturally found local fauna that decreases the need for additional watering. This means that you can have a beautiful, naturally designed landscape and keep water costs to a minimum! Not willing to make the jump to a completely desert look? We can still help. Let us condition your existing landscape with a specially tailored formula of mulches and soil conditioners to help you conserve water while controlling weed germination. This will enhance growing conditions for your plants, flowers, and trees while minimizing your water costs. Or let us upgrade your existing watering system to a premium water efficient sprinkler and drip system. 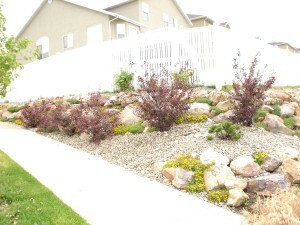 You’ll save money and your landscape will look fantastic. With over 20 years of experience in the Salt Lake valley landscaping industry, we are confident that we will not only meet, but exceed, your landscaping desires. Contact our specialists today for a design consultation.